"At the Heart of the Classroom: Teachers' Experience of the Suffering a" by Randall Kenyon Bartlett Jr.
Randall Kenyon Bartlett, Jr., PhD, is a 2015 graduate of the PhD Program in Leadership and Change at Antioch University. 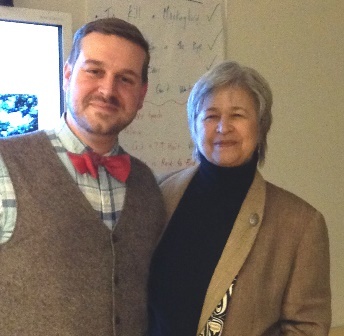 Dr. Randall Bartlett,[L], at his Dissertation Defense with Committee Chair, Dr. Carolyn Kenny [R]. 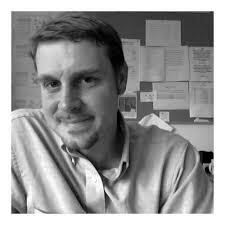 Randall Kenyon Bartlett, Jr., Ph.D.
Randall K. Bartlett Jr. has spent his professional career in education. He attended Oberlin College, receiving a BA in Religion and History. He began substitute teaching in Ohio and discovered a passion for teaching and education. Desiring to become a full time teacher he attended Antioch University New England and earned his M.Ed. and teaching certification. He taught in New Hampshire and Vermont before completing his principals license at Keene State College. He and his wife moved to Pittsburgh after their daughter was born and he became a principal in the Propel Schools system. After a number of years of building level administration, he moved to the central office, serving as the Director of Curriculum, Instruction, Assessment and Data. Around this time he and his wife added twin sons to their family. Randall completed his Ph.D. in Leadership and Change from Antioch University. In addition to his work with Propel, he has also served as the President of the Board of Trustees for the Waldorf School of Pittsburgh for the past four years. Bartlett, Randall Kenyon Jr., "At the Heart of the Classroom: Teachers' Experience of the Suffering and Success of Students for Whom They Care" (2015). Dissertations & Theses. 187.